Te Kaveinga presents results from the New Zealand Mental Health Monitor and the Health and Lifestyles Survey related to the mental health and wellbeing of Pacific peoples. 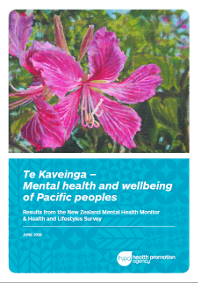 Published by the Health Promotion Agency, Te Kaveinga is the first in-depth analysis of Pacific mental health using a nationally representative dataset since Te Rau Hinengaro, New Zealand’s last Mental Health Survey. Overall, the findings show that Pacific adults experience psychological distress at higher levels than non-Pacific adults. The findings also tell us that Pacific peoples report high levels of wellbeing and family wellbeing, and are well connected socially and culturally.